My bead soup is ready. This is the 3rd and final reveal of the Bead Soup Party - 7th year that our Lori Anderson had organized. The ingredients that I received were rich and yummy I hope my bead soup is not too bland, or too spicy. You taste it and tell me. In my previous post I showed you what my partner Iveth had sent me. What I had sent her? Iveth wrote a wonderful post and you may want to pay a visit to her blog after you are done with mine. She wrote a beautiful post on it. The focal that Iveth sent was so pretty I wanted to keep it just the way it is, with a pretty organza ribbon or a bronze chain. But bronze chain or the ribbon? Take your pick - said the inner chef in me. Hold on...I must make some thing with it. I can't just hang it with a ribbon and say that's it! - I say. How about knitting with some wire of the same bronze accent? I love to do wire knit things...that's kind of my style. But, nope! I did not have the right shade wire. ( Soft Flex brand 26 g ). Would it be just the plain wire knitting or speckled with some color? Plain broth or some spices added, m'lady? - she interrupts. Some spices of course- I shout. Which ones m'lady? whines the inner chef again in a bland voice. Cheer up, boring you!- I holler. Can't you see I am trying to match the colors of the focal? I make a big mess sprinkling all kinds of beads on the bead mat. My inner critique does not like it. She has to clean it up later. 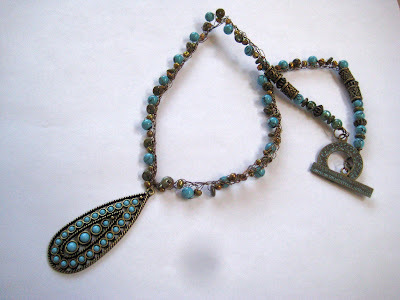 Some thing blue, some thing... why of course, Iveth had already sent me those beautiful turquoise beads. But it needs another color to give the oomph. I hunt through my pearl box. Nope...these are not the right shade. I yank out the car again from the garage. Another trip to Just Bead It store and I found the very right shade of dyed antique bronze fresh water pearls that I was dreaming of. Now I have them all ready. Time to string them all up. But in what design m'lady? I turn to my inner chef. She is the harshest critique I have ever seen. But she did not pout or make faces. I make a couple of earrings too. I put it on around my neck. Not too bad, I kind of like it. Do you have some suggestions? Blue is my favorite color. Thank you Iveth. Dear reader, please do visit all the other blogs of the bead soup participants and see what they have cooked up. Thats a lovely focal, and very pretty design! The wire work is really exquisite. A question about..Just Bead It. Is it run by Renu Gupta by any chance? Never mind...her's is House Of Beads in Walnut Creek..
Beautiful necklace Dita! 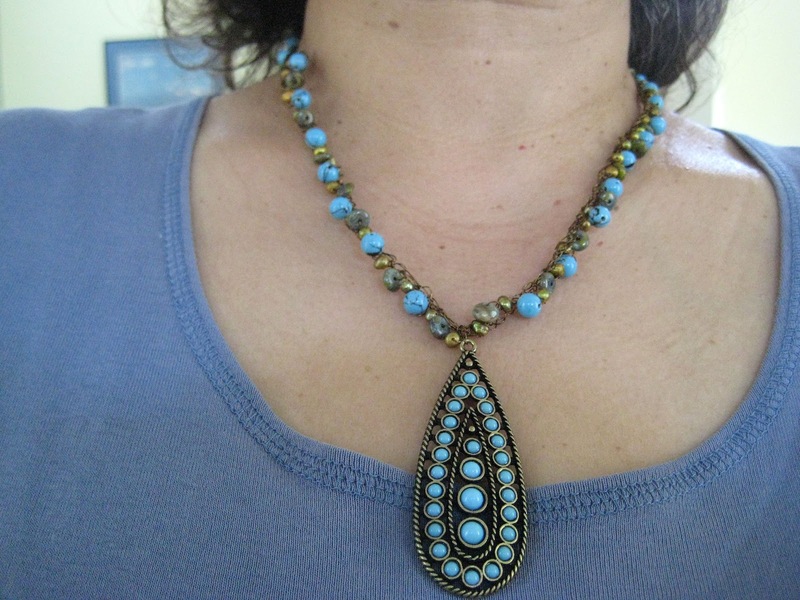 I love the colours - hadn't realised how well blue and bronze go together. And as a newbie wire crocheter (is that a word?) - I have complete respect for knitters/crocheters like yourself. Your work is so neat and tidy! What a beautiful set you created with your soup! Thats a very beautiful set. The necklace is so gorgeous! Congrats. I love your necklace. I would wear it every day, great design! beautiful design from start to finish! I love your wire knitting and beads you've included are the right colours. You've designed a gorgeous necklace. Your inner chef is definitely the harshest critique. Have a great weekend. Beautiful wire work: it perfectly complements that gorgeous focal! Lovely, Dita. Pretty necklace!!! Your choice of colors is perfect....and I love the little earrings, too. That necklace looks gorgeous on! Beautiful design work and love all of the intricate wire crochet. Lovely earrings as well! I love this set, totally my style! What a lovely soup, fab necklace you made from it too, love it. I think it's a beautiful set! I'm in LOVE with what you made! Your necklace is pretty. The focal is gorgeous and you accented it well. Lovely lovely pieces. Great job! The results were well worth your efforts. That knitted chain with beads is perfect for the focal piece! Nice work. Great work! That focal would've daunted me, it's so pretty on it's own! You did an amazing job with it! 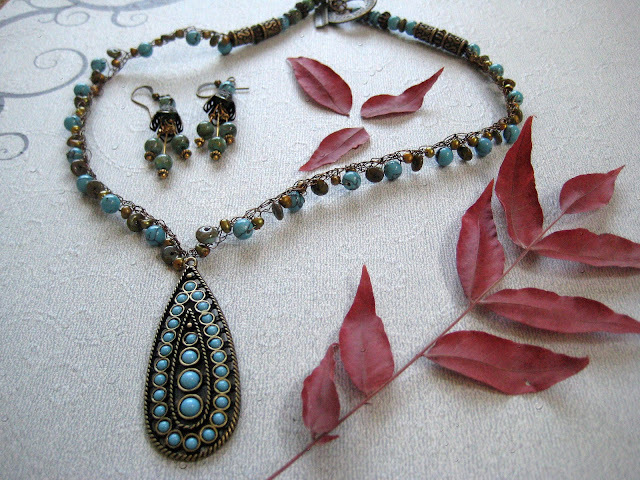 The focal is beautiful and your pieces very lovely! Such a beautiful set you made, I'm so envious of the wire crochet! Nice job with your soup! Lovely set! Well done you made some gorgeous jewellery. I would have been lost with that focal but you really made it shine. Wowsers that's gorgeous! I've never tried using wire in that way and it looks so fabulous. Is it flexible when knitted? Thank you for your comment. Wire knitting is not as smooth like knitting with yarn, but because wire has memory it will stay the way you knit, and I think it is kind of forgiving in that sense. Even if you make mistakes in wire knitting it will not be that big of a deal, you can manage it later. With practice things become better and more perfect. I like its effect. - Dita. Your inner chef led you down the right path, that's a really great necklace. And the earrings are delightful!